When I was brought onto the AmazonFresh design team there was an major initiative to migrate AmazonFresh from a standalone website/service to full integration onto the larger Amazon.com site. 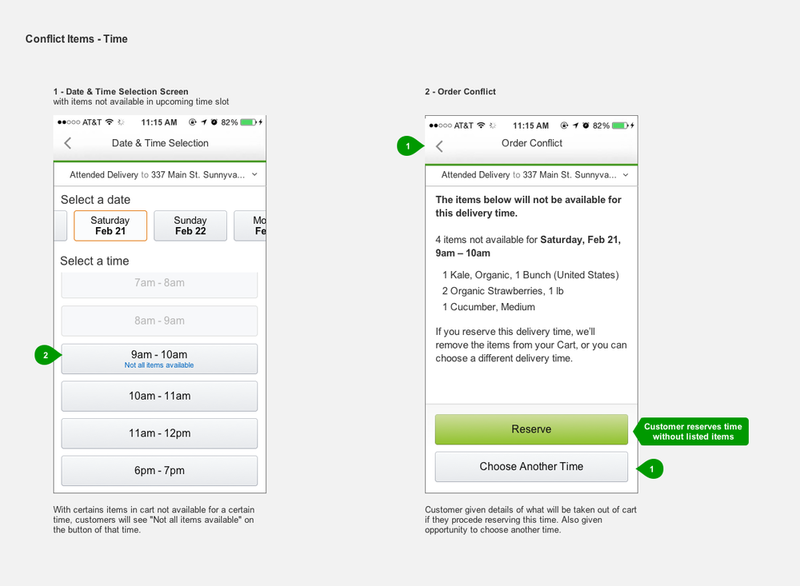 As a mobile UX designer, my job was to focus on designing the “Slot Selection” feature for AmazonFresh along with the AmazonFresh sub-navigation, which is to become part of the larger Amazon global header. A scalable solution that allows incorporating future plans to allow customers to pick up their own groceries. I had the opportunity to work on-site with the AmazonFresh team for the duration of this project. This made working with other designers, PM's and developers much more efficient allowing us collaborate quickly in a more agile environment. 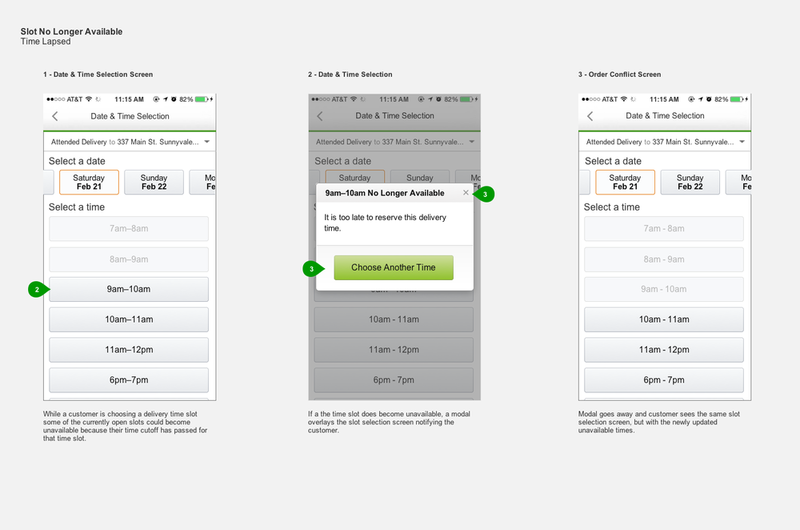 Some of the major variables I had to keep in mind for the Slot Selection design were numerous customer states based on their location, membership status and their expectations and preferences of both their current Amazon.com experience and their AmazonFresh experience. And looking forward, I had to incorporate into my solution the scalability of the Slot Selection to incorporate future plans to allow customers to pick up their own groceries; allowing them to get their orders as soon as two hours after placing their order. 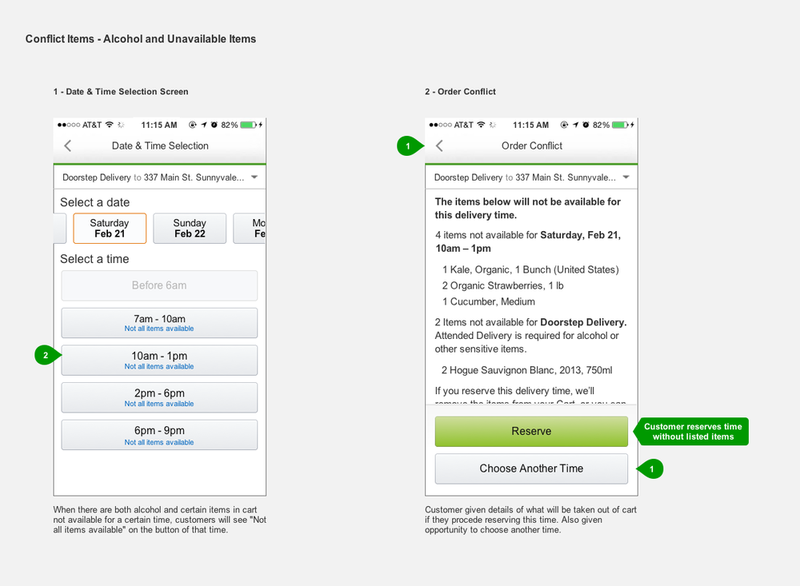 After exploring the current AmazonFresh experience for mobile and desktop, I started explore outside of Amazon for similar models of selection. Aiming for a simple and minimalistic approach, some of what I explored were checkout flows of various mobile apps, hotel reservation flows and airline ticket purchasing apps, which turned out to be most fitting due to the amount of choices and selection offered to the customers. But the potential edge cases of AmazonFresh customer experiences would still break these models, so I had to simplify things even further. 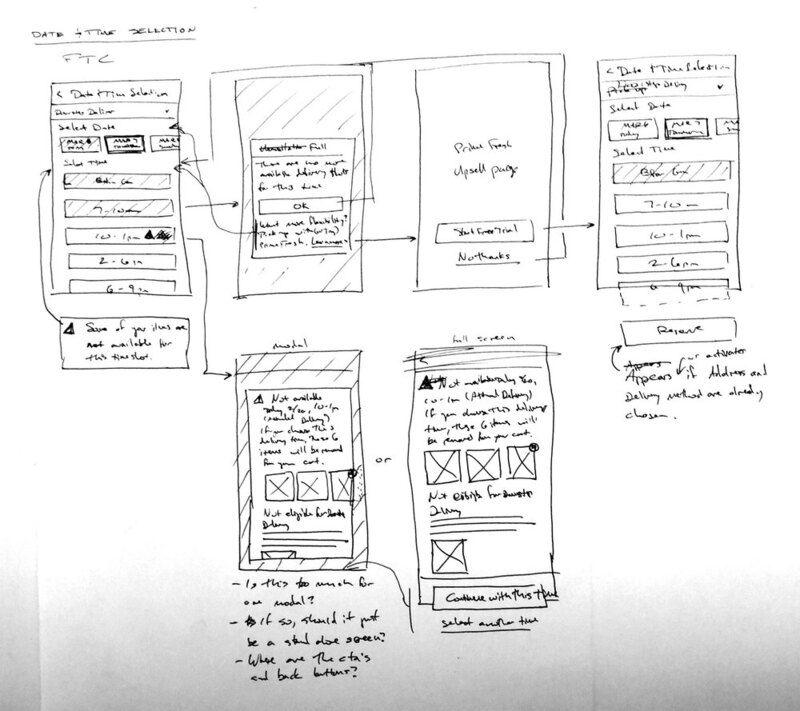 I, then, pushed for a design that focused on one choice per screen for the customer as opposed to trying to fit more into fewer screens. 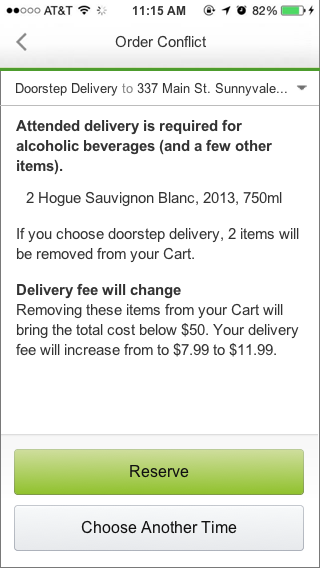 This allowed the customer to focus on one task at a time and quickly and easily schedule their delivery or pick up. Showing the customer their choices they’ve made on subsequent screens was to keep the context easy to access to assist in the next choices in the flow. 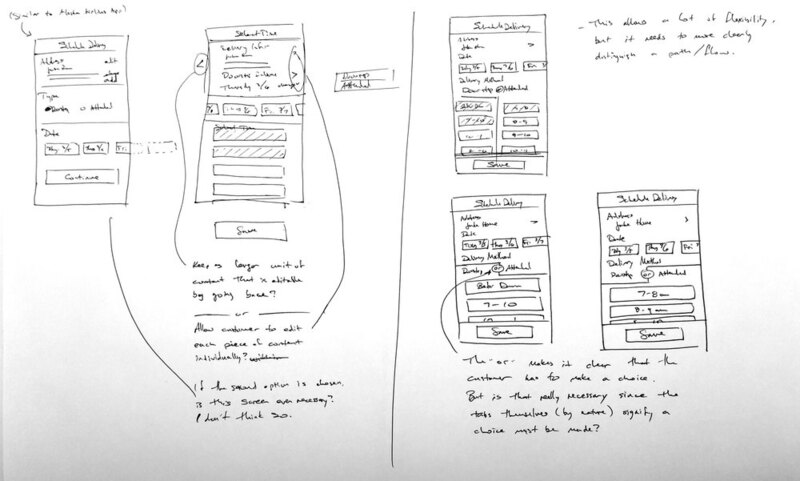 After coming to a seemingly solid solution, it was time to translate my sketches in higher fidelity Axure comps/prototype. From here it was clearer to see how this solution would fit in the mobile space and in accordance the Amazon’s AUI standards. I presented various iterations to the rest of the design team and project managers during our weekly team meetings for feedback. I was also able to sit in on some user testing of the integrated AmazonFresh experience into the overarching Amazon.com experience. I then reached a point with these designs where I presented them to the “bar raisers” for the AmazonFresh team, which was surprisingly well received with very little feedback for changes. 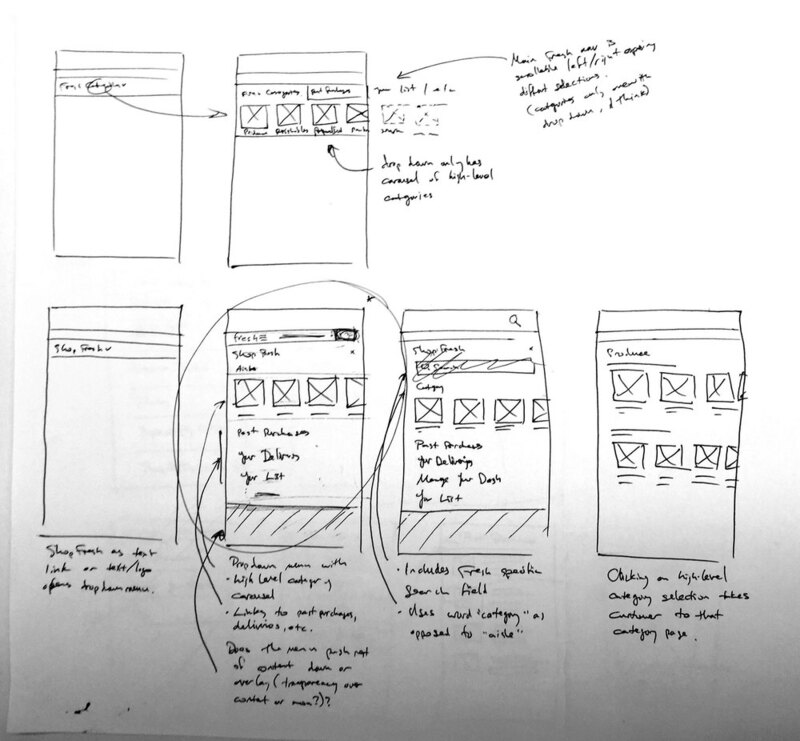 I was also asked to take a crack at coming up with a solution to incorporate the desktop design for a fairly robust sub-navigation into the mobile experience. The initial timeline for this task was just an hour, so I got right to sketching. The desktop experience included a drop down from the sub-nav with a carousel of featured “aisles” and links to the AmazonFresh section of the site and the customer's order history. A secondary drop down in the sub-nav had to display a very brief order status of the current order with more details shown when expanded. 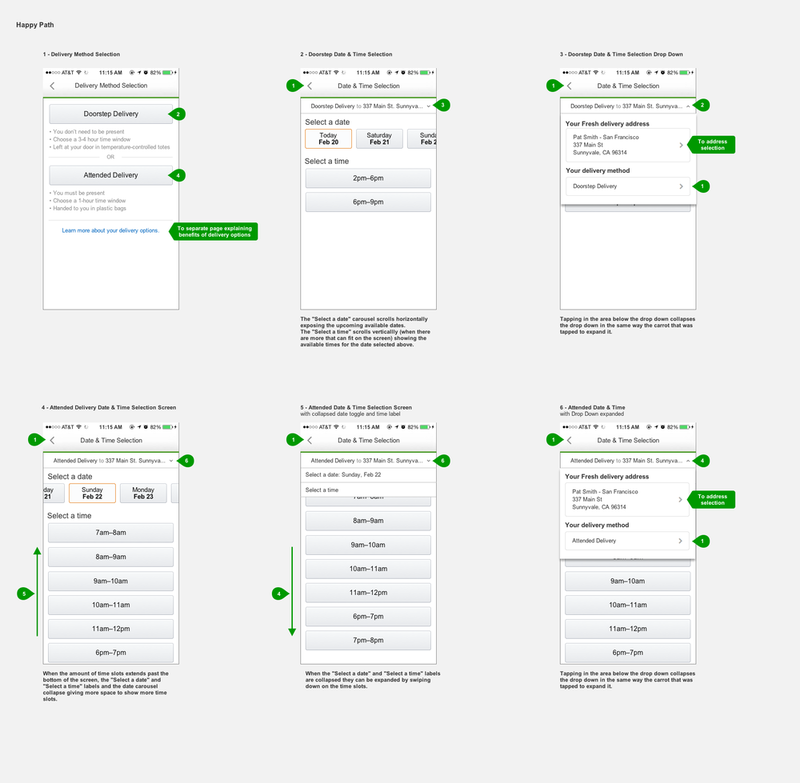 By keeping the sub-nav clean and concise, I was able to design a solution that only showed the content that was needed with each tap while still allowing the customer ingress points to the parts of the app they needed to and wanted to access.